Following the recent launch of its on-line design and ordering system IG Doors has extended its offers to installers wanting to buy Truedor. Richard Kirman Sales and Marketing Manager for the company’s trade division tells us that Truedor has clearly caught the imagination of the installer sector, with the new on-line ordering system under-pinning the excellent product range and marketing support package. “I said last month that ordering on-line was a must for composite door suppliers in today’s modern market; it is the way the industry operates and was very much on the wish list of all the people we had spoken to since we launched Truedor. The response to our launch has been fantastic, even better than we expected, and it gives our customers the flexibility to operate their businesses at times which suit them; they are not dependent on our sales office to place their orders, they can do that at any time”. Outstanding product range and great marketing support..
“We knew that making the on-line ordering system live was going to be a great boost for our customers, and for ourselves; when we set out to launch Truedor we were very clear on a number of things – we would have an outstanding product range, great marketing support, and we would make customer service the kingpin of our offering. Having the on line ordering system is very much a part of the customer service offering”. “We know from the feedback we have received so far that we have got our product range and our service levels exactly as our customers want them; the dialogue we have had with them from the start about what they expect from us will continue to ensure that we maintain the highest standards, and will enable us to continue to talk to them about what else they would like from us in the future. This dialogue with our customers is essential for success in the long term; we want to develop a loyal customer base which is with us for years to come, and we fully recognise that loyalty is a two way thing”. We are sharing the benefits of ordering on-line! 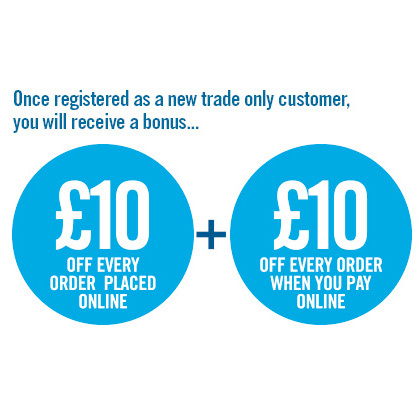 “There is also a first order discount of £50 available, and we would urge all installers to take advantage of it. It will give them the opportunity to see just how simple the ordering system is to use, how versatile the product range is, and just how well the customer service and delivery system we have implemented works to support them once their orders have been placed”. Next Time – Hear all about George Clarke’s recent visit to IG Doors, his support for Truedor, and plans to develop the consumer market.